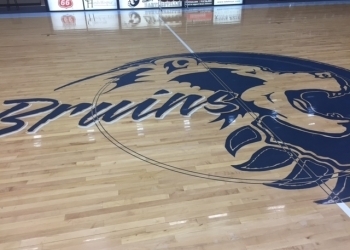 The Bartlesville High boys were able to pull off their best win in the Clent Stewart era on Tuesday night at Bruin Fieldhouse, while the Lady Bruins could not come back against one of the best in the state. On the ladies side first, Bartlesville dug itself too big of a hole early against the Lady Sandites, as Sand Springs got the season sweep over BHS, winning 60-48. Bartlesville scored only two points in the first quarter, and trailed 16-2 after one. The Lady Bruins would fight back within nine and 10 points on two separate occasions, but could not get any closer. Three of Bartlesville’s six losses over the past two years have now been to Sand Springs. On the guy’s side, Bartlesville used an offensively sound first half, and a good defensive second half to knock off the No. 5 Sandites 45-37. The Bruins allowed Sand Springs to score only nine second half points. Its 37 total points was the second lowest this season. BHS struggled offensively in the second half as well, but got enough plays to put the game away down the stretch. The biggest bucket came on a three-pointer from Jaylin Oliver with less than two minutes to play. The win for Bartlesville marks the first against a team ranked in the top-5 in Class 6A since Clent Stewart became head coach in 2014. Both Bartlesville teams are off until Friday when they travel to Bixby.